I feel like I just said "I don't do giveaways often" just a few weeks ago. Well, here I am, doing another one. However, this feels right! 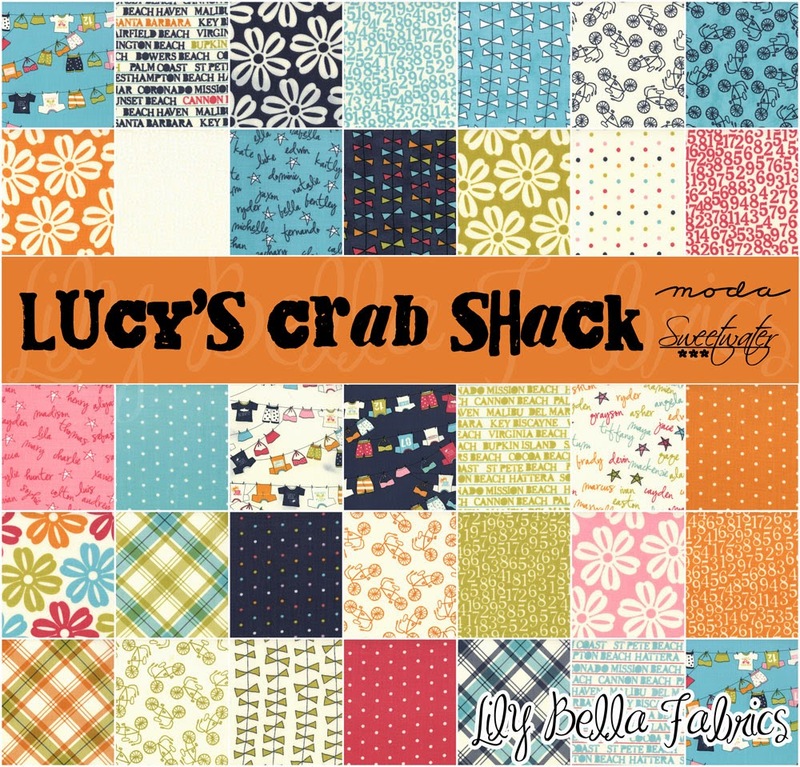 A Lucy's Crab Shack charm pack! Thanks for stopping by! If you want to hang out and look at some of my projects and tutorials, I promise, I won't bite. If there were actual elves, what would you love for them to do for you before the holidays? Item will be shipped no later than Friday, December 20th. Sorry...I can't get it to you by Christmas, but think of the possibilities for the New Year! Note: Yes! Will ship internationally! Sew Mama Sew is gathering the troops to deliver Giveaway Day again! Her bi-annual gathering of blogger's giveaways! Be sure to go check it out. Supplies and handmade items abound! I have always been a follower! What a cute charm pack! Thanks for the chance! Actually there are actual elves. Everyone tells me, and I agree, that my 21 months old daughter looks like one. So what I would love before and after the holidays is a beautiful life with her, my husband and our soon to come second baby. I'd love the elves to post in my blog. I love sewing but blogging takes soooo much time! Elves would need to clean my house, so that I could spend more time with my family, friends, and sewing (of course!). The elves would clean my house! I'm with Alison...clean my house! ;) I want them to clean my house, please. I'd have them organize my fabrics by color and maybe size!! Clean house and watch the grand baby so I could sew more! I need elves to finish all my last minute projects, iron the fabric, and do the boring parts! Er wrap gifts. I love doing it but it takes such a long time! I would love for them to organize my sewing space. Every time I look at it I sigh and do something else. A little overwhelming right now, though there is still room to sew somehow. If there were elves, I'd ask them to do the cleaning to have more sewing time. Thanks for the chance! Clean and organise the basement please? That would be greatly appreciated. Thanks! I need elves to clean! Then I'd have more time to sew! Thanks for the chance! My sewing room needs some attention! Seriously, it is pretty crazy in there. Thanks for the chance!! Clean my house! Yes, house cleaning elves would be wonderful! I follow you on The Old Reader! Oh! Clean my house! Rearrange things.....what a fun dream! oh the elves can tidy up my crafting room! Put my lights on the house!!! Clean and decorate my house while I sew. Clean my house I have been too busy to give a thorough top to bottom cleaning. Clean my house. They'd be perfect for all the low work like wrangling dust bunnies or fishing cat toys out from under the furniture (my cats would appreciate that). I need to reorganize several areas of my house and go through stack of things that have been there for a while. Would love to have a cleaning elf. Clean - I wonder if elves do windows? I think I would like the elves to fold my laundry AND put it away for me! Just one of those chores I can't stand! Love Lucy's Crab shack! One of the best lines ever. As I was doing laundry last night I sure wish I had someone around to help me fold it all - I hate folding laundry! I wish elves would clean my house and do my laundry and shovel the snow. I'd like the elves to make all my Christmas runners, placemats etc for ME as I've been too busy making them for everyone else. I would love the elves to dust my house!!! That is one task that I don't enjoy at all!!! i'd love it if the elves would put away the baby toys and do the dishes! I'd want the elves to clean my house so I can spend more time doing fun things with my daughter and, of course, sewing! I would ask the little fellows to magically finish all my house renos including my handcrafting room. I've hit a bit of a plateau with them. Can the elves come and clean my house? Thank you for the giveaway! If there were elves....I would love for them to do all of my house work for a week so I could get some sewing done! Thanks so much. Of course there are elves!! now if I could just get them to sweep away the cobwebs in my house! I would very much like the elves to clean up my garage and keep up on the dishes while I work on Christmas projects! take care of sewing the bidning to the back and all the loose threads from the quitling .. Tidy my house so I have more time to sew or garden! I'd get those little buggers to declutter the house before the christmas party on friday!!! Can they please clean my house? I feel like I'm always behind on cleaning around the holidays because there is so much else going on! Well, like a lot of the others here, have them clean my house, maybe do some laundry while they're at it. Thanks for the giveaway! Organize my storage room - because it's a wreck while I have my Christmas decorations out! Thanks for a great giveaway! I'm a new Feedly follower. I could use some housecleaning elves so that I could spend all of my time sewing. Cute fabric! I'd like them to clean my house, but if it needs to be Christmas related, I'd have them put up lights on our house. Thanks for the giveaway! I wish they would come clean my house! That'd be the best Christmas present, ever. Get all my international parcels bought and sent before the posting deadline passed. Something I NEVER manage any year. Ha! I'd have them wrap all my presents. :) Wonderful giveaway! I would love for them to do all my Christmas shopping! Thank you for the giveaway! HELLO,since many of my loved ones are in other States,I'd ask the elves to to the UPS trips! I need the elves to keep my house clean...all year long! Thanks for the chance! I would like it very much if the elves would clean my house for me. Please! Hang the laundry (I hate doing it), thanks for the chance to win. If elves were real I would love for them to come decorate my tree and house. Thank you for the chance to enter. I wish I had an elf to clean up after we bake cookies. And maybe to wrap presents. Thanks for the chance to win! Those elves can clean my house! In all those small, hard to reach areas! I'd love for them to dust my house. Thanks for the giveaway and Merry Christmas! I would love for them to clean my house, especially getting the dust and dog hair. Scrub my house. Including all the bits I don't get to regularly. pipe dream! I would have them cut out all the pieces that I need to make a quilt. I would love some cleaning elves so I could stick to the fun stuff...crafting and baking! I could use some elves to clean my house - thanks. Thanks so much for the chance! I'd love for elves to bake all the Christmas cookies/goodies for me. Finish the two quilts I am working on as presents!! Thanks! I really wish some elves would come and clean my house from top to bottom! Easy question! I need the elves to come and clean my house! Then I could enjoy the clean house with no work from me! Oh the elves would come clean my house! Fix all the little things around my house that need fixing. Thanks for the chance. I love this fabric line. Definitely CLEAN MY HOUSE!!! 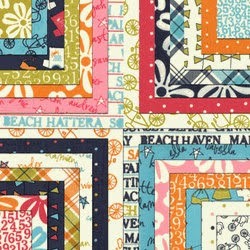 btw, I love sweetwater fabrics and love the Lucy's Crab Shack line!! I would love them to make me some handmade fabric treasures. Around here, I do that for everyone else, but receive some of these goodies would be a treat! Elf request...clean my house and then decorate. I've been busy with school and haven't had time but I want it decorated! Clean my house before my guests arrive! Clean my house while I am at work! I am with others on having the elves clean house, then I could have more time to do baking. Thanks for the giveaway. I would love for elves to clean my house! I would love the elves to clean my house! That would be pure bliss! Well to be honest, I don't want any help BEFORE christmas as I love doing all that pre-work, but AFTER...now that is when I'd love to have a few little elves around! 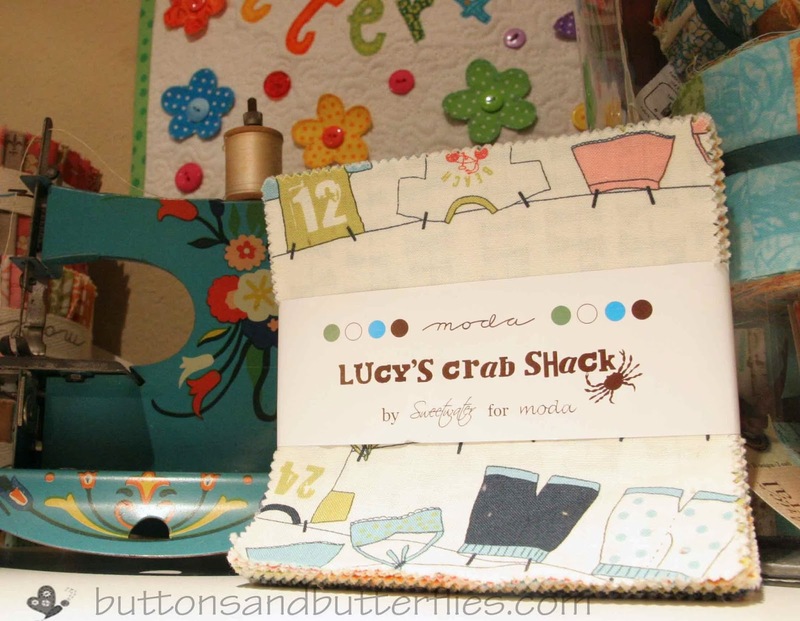 Love the crabby pattern! I just found you today and joined to follow via email! I would definitely have them figure out what to get my oldest son. He has asked Santa for a book (one, particular book) and some rubber bands for his bracelet loom. That's it. Argh. I love Lucy's Crab Shack -- it's darling -- thank you! Probably just clean my bedroom and wrap presents. Not too much. Thanks for the chance to win! I follow on BL-karrie smith, ksmith8@emich.edu. Thanks for the chance to win! I would like the elves to clean my house. If elves were real... I would have home take over cooking chores for the rest of the month. My wrapping! I have six kids and it really adds up! Clean my house and shop for gifts! I'd love to have some cleaning elves! I would love for elves to wrap my gifts!! I'd like the elves to clean and organize my house. Yes, indeed. I would love bathroom cleaning elves. Thanks for the giveaway! I would love some house cleaning elves so I could concentrate on the decorating and baking - the fun stuff. Thanks for the chance to win. I'd like an elf to clean my house while I sew!!! I would love the elves to organize everything in my home. I would like the elves to just be on stand by to do any cutting or pressing I may need. Then I could just focus on sewing. Those elves could do all my paper work and all those little things that get set aside, like outing the totes away after decorating. I'd love the elves to do all the pre-Christmas cleaning and cooking for me! I would love the elves to clean my house! Dear little elves, please clean my house for me! I would elves to clean and decorate for me! Thanks! The elves would clean and cook for me so I could sew! Thanks for the chance. i would love for elves to do our christmas cards! I would love them to unpack my house...I just moved last week! I would love elves to unpack my garage and find everything I can't find! I am following via email. If the elves would be so kind as to fold and put away my laundry, that'd be great. Don't know why that step always trips me up! I would LOVE for the elves to do a last minute tidy-up just before Christmas & if my sewing room could be included, that would truly be magical! Thanks so much for the lovely giveaway. I'm a new follower of your blog, via email subscription, thanks! I would love for them to clean and pack my house. We are moving at the end of January so with Christmas and packing and daily life, I'm feeling a bit frazzled. I'm really hoping the elves will show up to clean my whole house, put all my 19 years' worth of photos into scrapbooks, put a new door on my son's closet, and defrost the downstairs freezer. Oh, and take the car in for scheduled maintenance. Thanks! I would have those elves get busy cleaning this house and I would hope they could figure out a way to motivate me to get busy wrapping and mailing. I have been following you via GFC for quite awhile now. Great giveaway... thansk for the opportunity! I would love the elves to clean and cook for me so I could sew! Thanks for the giveaway! I would ask the elves to wash my windows so they would sparkle and the Christmas lights would bounce off of them. Thanks for the opportunity! Clean my fridge and oven please! I need elves to finish cleaning the house! I would love for them to wrap my gifts…not one done yet.